I treated myself to an early Christmas present by purchasing Rodney Saulsberry’s book Step Up To The Mic. It was a present in more ways than one. Saulsberry is a well-established voice actor who attributes his success to a positive attitude. It’s the sort of uplifting book that I would have liked to have written. Chapter 8 is my favorite chapter in the book because Saulsberry presents “Empowerment Exercises”. I particularly enjoyed the affirmations on page 82-83, perhaps because I used one and was delighted when it came true! One thing that I don’t recall seeing in this book is the firm advice to write down your goals although Saulsberry does mention the steps used in goal-setting. I am an advocate of writing down goals, especially after reading the book Write It Down, Make It Happen: Knowing What You Want And Getting It by Henriette Klauser. Klauser wrote about dozens of examples of people writing their goals as a roadmap to their lives. However, with multiple computers, journals, a smartphone and various scraps of paper in both the studio and office, it wasn’t always easy for me to remember my great ideas and plans. I had wonderful ideas for marketing my voice-over business, but I couldn’t find them. After listening to David Bourgeois on the Voices.com Voice Experts podcast a few months ago, I decided to follow his method for creating a business plan. 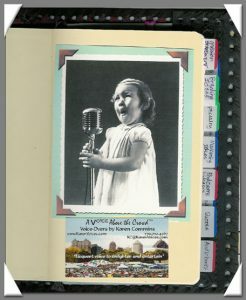 I bought a Moleskine notebook and tabbed it with headings about everything related to my voice-over business. I currently have 10 sections in my voice-over planning book. If I see a promotional product that I want to send to people, I clip out the picture from the catalog and put it in the Marketing Ideas section. If I have an idea for a blog entry but don’t have time to write about it (as is so often the case), I make notes in the Blog Ideas section. I also have ideas for podcasts and e-books that I want to create. I carry the book with me everywhere and find myself constantly adding to it. Just looking at my voice-over journal makes me happy! Given the books that I read and the one I am now writing in, it’s easy to maintain a joyful outlook and positive attitude about my voice-over career! I have been looking for a place to get info about voiceovers. I feel like I’ve struck gold, having found you via APA. I have just started to read the valuable information that you are so generous to share. Thank you so much. I’m a late bloomer, 63 yrs. old, but having studied oral interpretaion and acting in the past, I hope that I may be able to utilize the info. you offer and find my way to creating a way to retire from teaching and have a little income. Hi, Cookie. Thanks for the nice note. I’m so pleased that you are finding the info on my site to be helpful. Voice-over is a profession that is open to all ages. If you can dream it, you can DO it! Congrats for having the courage to go after your dreams! Karen, thanks for sharing your insightful comments. You’ve given me the boost that I needed to keep trying to get my (part-time) career going! Hello, Kay! I’m delighted I could give you a little boost today! Your kind words certainly gave one to me in return. I had a part-time career in voiceover and audiobook narration for the 12 years I worked a day job. I found it helpful to think of it as my full-time vocation since it occupied so much of my thought life. By writing down your goals and taking steps toward them every day, you soon will be living the life of your dreams!